Today we will be taking a look at the sales activity for Single Family Homes in the neighborhoods of Coconut Grove, Coral Gables, Pinecrest and South Miami for the 2017 – Quarter 2 period. As you may recall, in an earlier post we had analysed this same info for the 2017 Quarter 1 period – read our post here. By exploring the recent sales in these top 4 neighborhoods we will have an insider’s perspective as to what the current market looks like. Let’s dive right in and take a look at the numbers. All data utilized in this post was gathered from the Miami Association of Realtors – Multiple Listings Service, effective Tuesday, 7/11/2017. 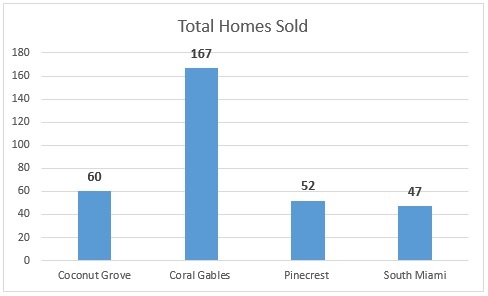 For 2017 Quarter 2 (4/1/2017 – 6/30/2017) these were the Single Family Homes sales in each respective area – Coconut Grove (60), Coral Gables (167), Pinecrest (52), and South Miami (47). These sales numbers were higher for each respective neighborhood as compared to the 2017 Quarter 1 totals. A great market indicator which provides an apples-to-apples comparison for each neighborhood is the average price per square foot. 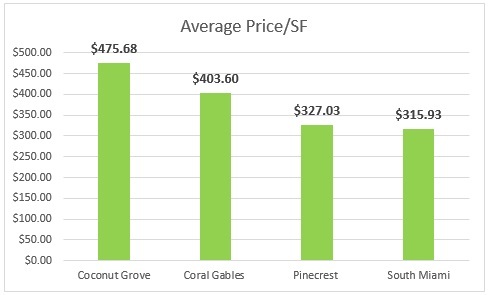 As shown above, these were Coconut Grove ($475.68), Coral Gables ($403.60), Pinecrest ($327.03), and South Miami ($315.93). While these statistics are very helpful, we understand that the home buying process is ultimately a very personal decision. A prospective home buyer must examine the numbers but then ask themselves what type of lifestyle are they looking for in their new home? If you are seeking an active, pedestrian friendly lifestyle with easy access to numerous marinas, parks, and the outdoors as well Miami’s top private schools then Coconut Grove is just what you are looking for. Coral Gables on the other hand is considered one of the most architecturally beautiful neighborhoods in the country. Beautiful foliage line its streets and it has a rich history. A young couple might find that South Miami is worth taking a closer look at. This neighborhood has grown in leaps and bounds over the past decade while still offering a safe and secure environment for any family to grow. For those seeking large, expansive lots and various types of mature trees seamlessly infused with modern construction Pinecrest is just the neighborhood that you are looking for. The graphs below offer a better visual representation of the data displayed in the table above. By comparing the previous number of Single Family Homes sold in 2017 Quarter 1 to the sales numbers above, we see that the Miami market for these specific areas has shown an increase across the board in total transactions. 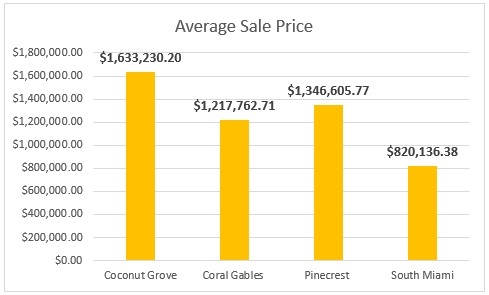 It may appear that sales in Coral Gables far exceed the 3 other neighborhoods however one must take into account the fact that Coral Gables is geographically much larger than the other 3 neighborhoods which have a smaller footprint. Again, to re-examine the numbers for 2017 Quarter 1 visit our earlier post here. The illustration above depicts the Average Price/SF for each respective neighborhood. When compared to the previous quarter, each area increased by $18-$25 on average. The illustration above denotes the Average Discount for each of the 4 respective neighborhoods. Here Average Discount is calculated as the percentage which a home buyer is able to successfully negotiate off the original home sales price. 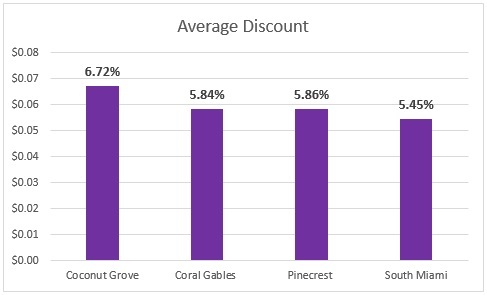 For example, in Coconut Grove the Average Discount was equivalent to 6.72%. This means that for every $100,000.00 of the original home asking price, the buyer successfully negotiated down $6,720.00. The illustration above shows the Average Days on Market for each of the four examined neighborhoods. These were: Coconut Grove (113.23 days), Coral Gables (99.09 days), Pinecrest (123.08 days), and South Miami (105.28 days). Here, Average Days on Market reflects the number of days which properties sat on the market before going under contract. If you are curious as to what the current inventory is for any of these four great Miami neighborhoods check out our detailed neighborhood guides below. Our site always offers the most up-to-date, accurate info available for all your Miami residential real estate needs. If you are considering to purchase, sell, or rent in any of these neighborhoods contact us today! 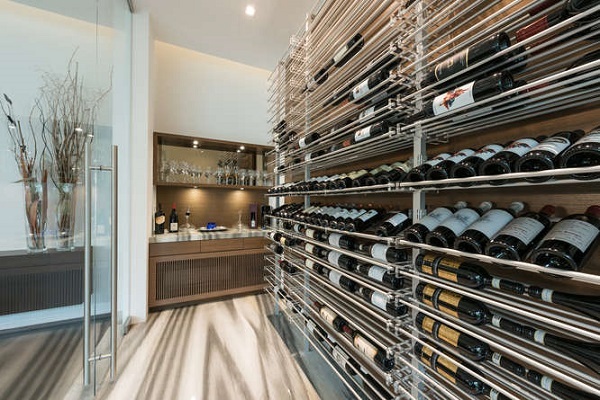 Our team of highly experienced and qualified agents have an acute understanding of the Miami real estate market and are equipped with all of the tools necessary to help you meet your personal residential real estate needs. Don’t delay, contact us today and let us help you make your dream a reality!